Want to sell your used car quicker? An effective way to sell your used car is to let me produce a simple video “walkaround” of your car or truck. It’s what car salesmen do with prospective buyers: walk them around a car as they point out various features and options. I’ll then place your video on my very popular YouTube car review channel. Why Let Me Do a Video Review of Your Car? In the last 28 days, my YouTube channel has received 143,684 minutes in watch time and 32,637 views. My car channel is popular and growing. I can back that up with proof also. As I continue to grow, my videos will take more and more views. IF you let me do a video review of your used car, truck or SUV you will sell your used vehicle faster. You can share the videos I do in whatever advertising you’re doing to sell the car. 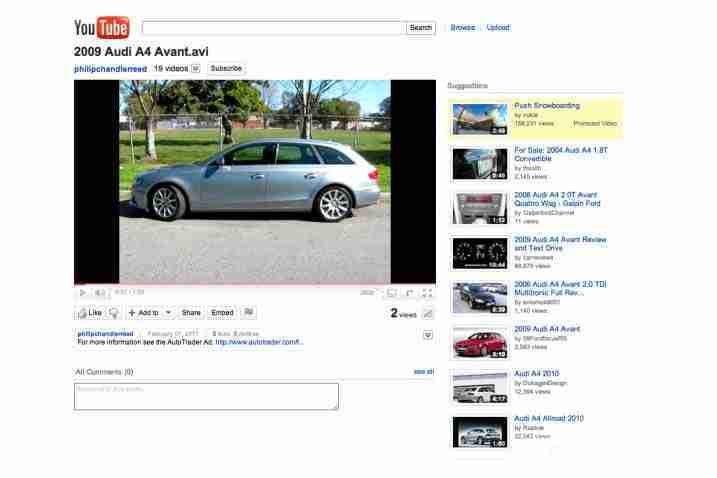 If you add a link to JUST your Craigslist ads linking to the video, you’ll sell cars faster. New customer research undertaken by CitNOW discovered more than half of clients believe an online video tour of a used car for sale is an essential part of the used vehicle listing. And 7% pro-actively request a video when one isn’t readily available. A video ad on YouTube is a powerful tool for selling your used car. A video ad gives shoppers the feeling they are standing beside your vehicle, listening to me while they enjoy anonymity as I describe the features and options. They do not have to drive anywhere to find the vehicle you’re selling and don’t have any sense of obligation about buying it. Clicking on a video connection is a lot easier than picking up the phone and calling a vendor they do not know. According to Dealer.com, 59 percent of shoppers reported they would pick a seller with a video review over one without if they were to find a similar vehicle. Meanwhile, a YouTube spokesperson said that online video ads are increasing, pointing to the fact that a search for the term “used cars” generates 256,000 hits on the website. If a video review of a used car can work for auto dealers, it can work for you. Contact me and let me help you sell your car faster.